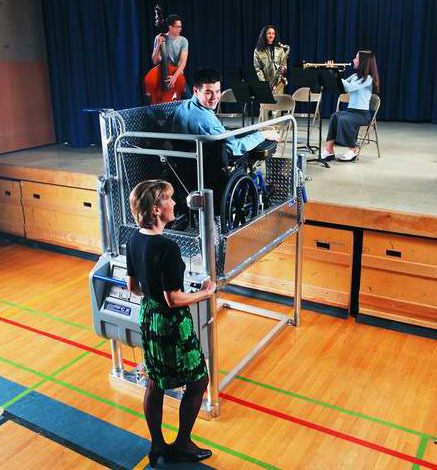 Our rental wheelchair elevators are manually operated and provide ADA compliant access to buildings, stages, outdoor bleachers, or elevated platforms. We currently offer units that are operable up to a height of 6'-0". These lifts operate without motors, electrics, or hydraulics, making them extremely reliable and easy to use. They weigh approximately 268 pounds and can be transported in the back of a pickup truck. The lifts are delivered completely assembled, allowing them to go to work immediately. Although the elevators are intuitive to use, and have instructions adhered to them, you should designate competent operators to assist the end user in proper product operation. Upon request we can provide a copy of the manufacturer's Operating Manual - and can also provide instruction - at the time of delivery. Our rental lifts (model "Mobilift CX")are manufactured by Adaptive Engineering, Inc.. The ADA sets out expectations related to access. The detail around compliance with those expectations is set out in ADAAG (ADA Accessibility Guidelines). In turn, ADAAG references other legislation that is specifically related to the access issue of concern. In the case of wheelchair lifts, ADAAG states that lifts will comply with the ASME Code. The regulations in the ASME code are aimed at permanently installed powered lifts and elevators. The ASME regulations specifically state that they do not apply to portable wheelchair lifts. As portable wheelchair elevators used to provide temporary access, our lifts are exempt from the ASME code and meet all requirements of the ADA for temporary access lifts.